This is best serve with walnut butter biscuits. Yes, it's again from Tessa Kiros. I am so putting 'Apples For Jam' to turbo use. It is halfway through winter and I've been posting so many sorbets and ice creams. I know it's really inapproriate but I can't help myself from making them. Another batch just went into the fridge, waiting to be churn. Call me crazy, but I am simply enjoying my holiday and I find it fun to do things in the kitchen all day long! This is so simple that you wouldn't believe how simple they are. No stove top require. All you need is 3 mins! Mix together cream and maple syrup in a container that has a lid. Whisk in the milk and vanilla. Put the lid on and pop it into the fridge until ready for churning. Preheat the oven to 190°C and line a small tray with a small square of baking paper. Cream together the butter and sugar until smooth. Add in the flour, one tablespoon at a time, kneading until a crumbly dough is formed. When you're able to form a buttery dough, stop kneading. Add in the walnuts and incorporate. Divide into 4 cherry tomato size balls and place it on the tray. Bake them at 190°C for 15mins or until golden brown. Here comes the evil part, cool them completely and roughl pulse them until you get golden sand and spoon these over your scoop of ice cream. I left some chunks larger so I would be able to taste the bits of buttery biscuits.This recipe could be easily decupled to get 40 biscuits. Just add a teaspoon of vanilla extract to it when you cream the butter and sugar. You could also make an indentation when they are all placed on baking trays and fill up the indentations with coloured icings of your choice if you are serving this for a kid's party. It might not look appetizing but it is very refreshing, lemony and very strawberry according to my housemates. I know it is winter now but I couldn't stop myself from pulling out the ice cream maker and churn these. Strawberries are everywhere now and I can't help but buy punnets of these little red babies. 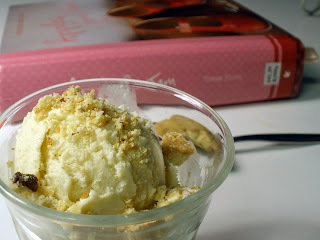 I've enclosed Tessa's recipe here but I made this by looking at it once and do it by what I feel is right in a sorbet. A splash of water here, a dash of milk there and I used up whatever strawberries I had in hand. I don't remember putting in that much sugar because my strawberries was rather sweet so here goes the recipe if you're a newbie in making sorbets. Puree the strawberries in a blender or a processor until they are completely smooth, then tip them into a medium-sized bowl that has a lid. Put the sugar, lemon juice and lemon peel in a pan with 375ml (1 1/2 cups) of cold water. Bring to the boil and cook, stirring for just long enough to dissolve the sugar. Remove from teh heat and leave to cool for 10 mins or so. Fish out the lemon peel and pour the syrup into the strawberry puree. Add the milk and mix well, then put the lid on and out in the fridge until completely cooled. Now put the bowl in the freezer. After an hour give the mixture an energetic whisk with a hand whisk or electric mixer. Put it back in the freezer and whisk again after another couple of hours. When the ice cream is nearly firm, give one last whisk and put it back in the freezer to set. Alternatively, pour into your ice cream machine and churn, following the manufacturer's instructions. If you do use this, you'll get a particularly smooth sorbet with no icy granules. This is best served with a small dollop of fresh cream or totally alone.